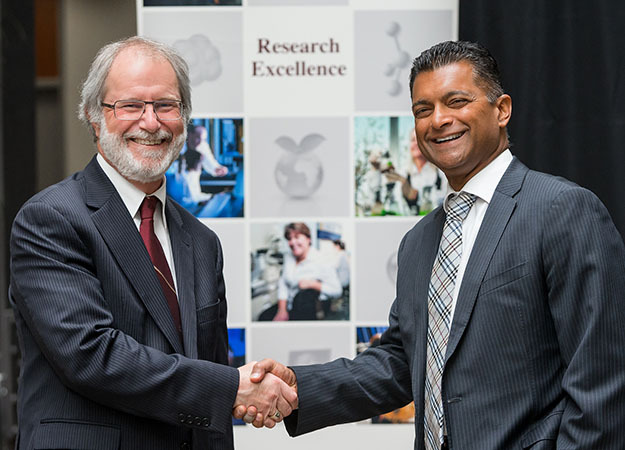 McMaster President Patrick Deane (left) and Nitin Kawale, president of Cisco Canada, pictured at Wednesday's funding announcement. McMaster and Cisco Canada announced Wednesday they have established a long-term relationship which will see the University increase research activities in integrated health biosystems and bioinformatics. Both parties will also establish a University-wide “research cloud” computing environment and infrastructure. This relationship will see McMaster build on its renowned research successes and strengthen its links with national and international partners from academia, government and industry. As part of the agreement, Cisco is providing a $2.1 million contribution to McMaster. This includes $1.6 million over eight years to establish a Professorship in Integrated Health Biosystems and $500,000 over five years to establish a Research Chair in Bioinformatics. The Research Chair in Bioinformatics will collaborate on a program in integrated health biosystems. The aim will be to bridge the existing gulf between data-intensive areas of biomedical research and healthcare by integrating diverse biological datasets with clinical and environmental data. President of Cisco Canada, Nitin Kawale, said researchers currently have the challenge of making vast amounts of data accessible to the right people for maximum benefit. Current research initiatives at the University tend to store data in separate databases. By creating one simple cloud-based infrastructure to house research data and provide high performance analysis, multiple faculties at McMaster will have easy access to technology resources, and will be able to share data and collaborate. In the future, this research cloud could serve multiple institutions and research facilities. McMaster and Cisco Canada announced Wednesday they have established a long-term relationship which will see the University increase research activities in integrated health biosystems and bioinformatics. Both parties will also establish a University-wide "research cloud" computing environment and infrastructure. This relationship will see McMaster build on its renowned research successes and strengthen its links with national and international partners from academia, government and industry. As part of the agreement, Cisco is providing a $2.1 million contribution to McMaster. This includes $1.6 million over eight years to establish a Professorship in Integrated Health Biosystems and $500,000 over five years to establish a Research Chair in Bioinformatics. The Research Chair in Bioinformatics will collaborate on a program in integrated health biosystems. The aim will be to bridge the existing gulf between data-intensive areas of biomedical research and healthcare by integrating diverse biological datasets with clinical and environmental data. The Professorship in Integrated Health Biosystems will help to establish a cloud-based computational infrastructure designed to manage, analyze, integrate and distribute the vast amounts of data resulting from biomedical research, clinical trials, and patient feedback. "The chair in bioinformatics and the professorship in biosystems will allow us to increase our research capacity and capture the value of the exponentially increasing volumes of data generated by our researchers," said Deane at Wednesday's announcement. "This investment will give us the much needed infrastructure to share our information with our local, national and global partners." President of Cisco Canada, Nitin Kawale, said researchers currently have the challenge of making vast amounts of data accessible to the right people for maximum benefit. "Cisco and McMaster both realize that this challenge can be turned into a fantastic opportunity to not only improve the way this data is managed, but to also analyze how people’s connection to others and to devices continues to evolve. This innovative project has the potential to transform the way academic research is conducted in Canada and throughout the world." Current research initiatives at the University tend to store data in separate databases. By creating one simple cloud-based infrastructure to house research data and provide high performance analysis, multiple faculties at McMaster will have easy access to technology resources, and will be able to share data and collaborate. In the future, this research cloud could serve multiple institutions and research facilities.